Some recipes I have saved from her blog: Blueberry Crumb Bars, Spinach & Artichoke Dip in Fillo Cups, and Loaded Potato Salad. Check them out! So, I made some donuts for fall. 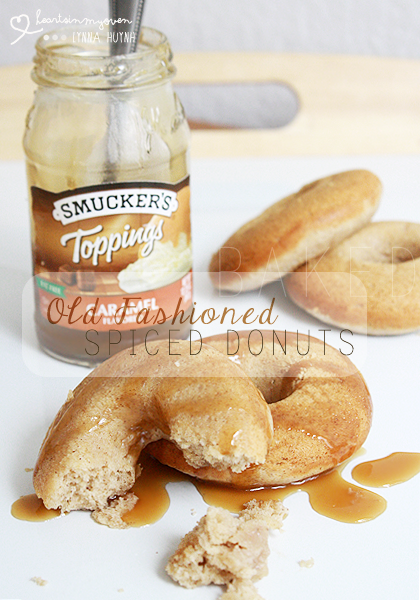 And I topped them with caramel sauce because, c`mon that stuff is DELICIOUS. Head over to: Sweet Remedy for recipe + post. Thanks for guest posting for me Lynna! I'm buying a donut pan right away! That photo is awesome - makes me want a doughnut with my coffee! You're sweet to do guest posts. You must be a machine to do two blogs at once! OMG. That is a great idea Sydney... I bet they`ll be great with coffee! LOL. I must confess I had both guest posts slightly late than I had original hoped! These look so yummy! I"m making doughnuts today too :) Apple cider ones - I'm obsessed with the ones we always get from the apple orchard, can't wait to make them tonight! Off to check out your recipe, deliciousness pics girl! Oh, those sound DELICIOUS! :D can`t wait to see a recipe!